Norway has long used technology to streamline processes within the public sector and bring the government closer to citizens and businesses. Now the country is going further, seeking to transform its public sector through the full assimilation of digital technologies. The goal is to make it more efficient, collaborative, user- and data-driven, and better able to respond to the changing needs and expectations of citizens and businesses. This review analyses the efforts under way and provides policy advice to support the Norwegian government in implementing digital government. This Digital Government Review of Norway is designed to support the Norwegian government in harnessing digital technologies for more efficient, inclusive, open and citizen-driven public policies. The review’s policy recommendations provide insights on important policy areas such as the governance of digital government, a strategic approach to commissioning digital goods and services, the development of digital skills inside public sector institutions, and developing a public sector that recognises the social, economic and strategic value of government data. The review underlines the high digitalisation level of Norway’s economy and society, which creates favourable conditions for digital government within the public sector. 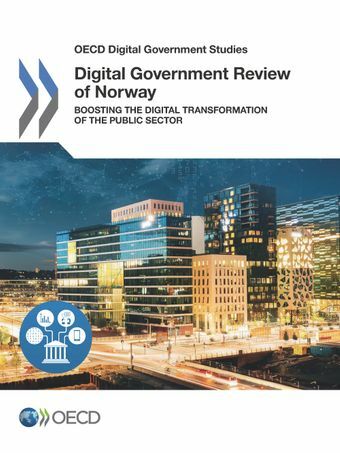 The report urges the government to capitalise on the important results achieved so far to ensure the continuous contribution of digital government to public sector productivity, business innovation and social engagement in Norway. Norway is among the top ten OECD countries in relation to open government data. The index assesses governments’ efforts to implement open data in the three critical areas - Openness, Usefulness and Re-usability of government data. Data for the index is taken from member countries and focuses on government efforts to ensure public sector data availability and accessibility and to spur a greater re-use. The Index is based on OECD methodology and the guidelines of the G8 OGD Charter.